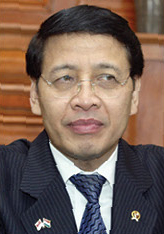 N. Hassan Wirajuda is a former Foreign Minister of Indonesia and co-founder of Indonesia's School of Government and Public Policy. Economic Community. Its leaders then decided to study the merit of Singapore’s proposal. Indonesia bore the brunt of the East Asian financial crisis and saw it turn into a multidimensional one. We, thus, immediately saw the merit of Singapore’s proposal—provided, of course, that ASEAN develop a concept of community-building involving its ten Member States in a balanced manner. In other words, we supported Singapore’s economic community concept as long as it was complemented by an ASEAN political and security community, for we had assessed that this was what was required in order to make sustainable the processes of intensified cooperation and integration.